Ketan Patel MD, FAAEM, is the Associate Program Director for the Emergency Medicine Residency program at University Medical Center in Las Vegas, NV. He is an Emergency Provider for the Las Vegas Golden Knights professional ice hockey team. He volunteers as Medical Director for Las Vegas Ski and Snowboard Resort Mountain Patrol and Camp Cartwheel – Nevada Childhood Cancer Foundation. He has been with USAC since 2012. Dr. Patel received his Bachelors of Science from The University of California in San Diego, CA. He graduated Medical School at Saint Louis University School of Medicine in Saint Luis, MO. He completed his Emergency Medicine Residency at The University of Nevada School of Medicine in Las Vegas, NV. There, he was named Emergency Medicine Intern of the Year and served as a chief resident his final year of training. Dr. Patel’s professional memberships include; The American Board of Emergency Medicine, American Academy of Emergency Medicine, Council of Residency Directors, American College of Emergency Physicians, and American Medical Association. He was awarded Faculty of the Year by University of Nevada School of Medicine in 2014. 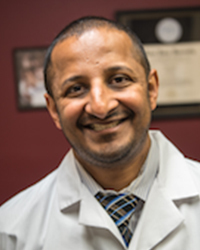 Dr. Patel is certified in Advanced Cardiac Life Support (ACLS), Advanced Trauma Life Support (ATLS), Pediatric Advanced Life Support (PALS), and by the National Ski Patrol (NSP) as a Certified Patroller. He is licensed in California, Nevada, and Arizona. Dr. Patel enjoys International travel, endurance running, event medicine, and medical education. He can speak Gujarati, Hindi, and Spanish.